Just in time for pre-running the 2014 Dakar Rally, Olympia has unveiled their new Dakar jacket and pants. Desert racers - and those living in hot climates - will certainly appreciate the mesh panels used through out the jacket and pant for maximum airflow. Olympia has long been known for incorporating well-thought out and useful features to make their gear as versatile as possible -- the Dakar range is no exception. The Olympia Dakar Jacket was designed as a multi-season jacket that is at home both on and off-road. Depending on your temperature tolerance, this could be a 4-season jacket, particularly in climates where the thermometer rarely dips below the 40s. Delivering this multi-season functionality is a two-stage liner system that incorporates waterproofing and insulation. The waterproof liner is a finished destination liner that can be worn independently from the jacket. The thermal liner has Thermolite insulation and can be used together with the waterproof liner, or the two can be independent from one another. 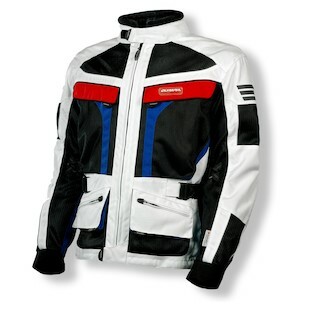 The outer shell is made from durable Cordura with mesh panels that are permanently open. Since the waterproofing is a liner and not baked into the shell of the jacket, this venting is direct to the body. The only way to close it off for cooler weather riding is to put the waterproof liner in and use that to keep the wind off you. The Olympia Dakar Pants have their own party trick: the pant legs zip off at the knee to convert to cargo shorts when off the bike. Safety has not been compromised (too much) here though, with the pants using the same Cordura construction and mesh panels. 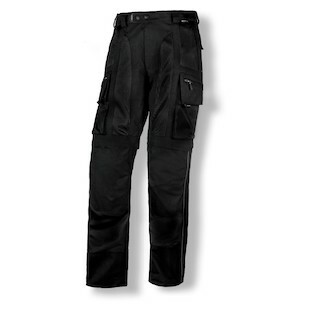 The pants have adjustable CE rated knee armor with the pant legs in place, and knee-high side zippers for easy access with boots on. The Dakar jacket comes with removable CE rated armor in the shoulders and elbows, and comes with a CE rated back protector. The jacket collar is neoprene-finished for comfort, YKK zippers are employed for durability, and 3M Scotchlite keeps you visible and safe. There is even an 8” zipper to connect the pants and the jacket into one unit. Perhaps the biggest news of all, especially to those familiar with Olympia gear, is the announcement of new colors! Black and Neon (HiViz) Yellow remain as the staple colors, but they are now joined by a new Ivory/Black colorway and a Red/White/Blue “Patriot” option. The Ivory and Black looks particularly sharp, and we are very glad to see Olympia branching out into new color options.